I am sometimes mortified by what I see in my own neighbourhood. And I'm not talking about Sin City shenanigans. 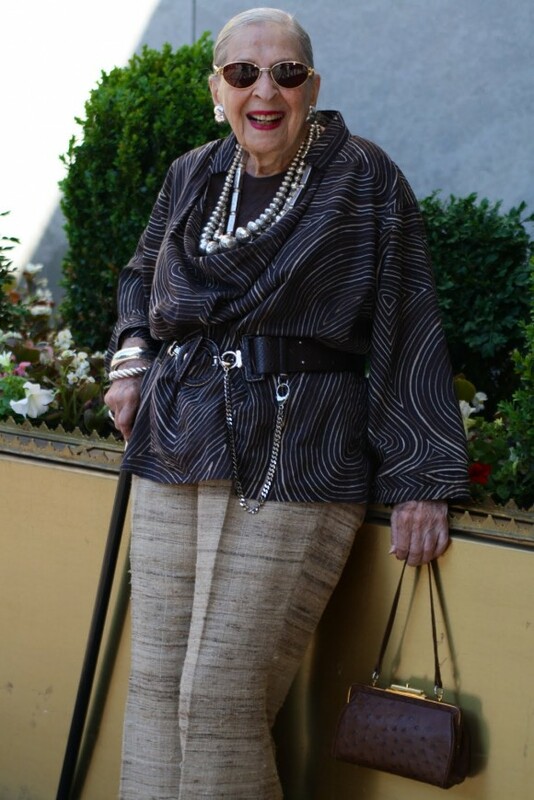 Nor am I referring to this lovely lady above, who is the grand old age of 100, and still makes an effort. I'm just talking about personal presentation. I've heard all kinds of reasons for why someone shouldn't walk out the door looking their best. Motherly Advice style lecture coming, so if you're not in the mood, click away now. I'm too tired to bother - being tired is no excuse. I've raised four kids. One of my sons has a severe physical disability and requires 24 hour intense support. I'm often tired, and I still look in the mirror before I leave home and adjust my appearance so that I look like I care. If your fatigue is related to depression or other health issues, you might find that taking more care with your appearance may assist in alleviating some of your symptoms. People relate to you differently when you dress well, too. Making an effort with your personal presentation might boost your mood in all kinds of ways. I'm too busy with the kids - Believe it or not, even children like it when their Mum looks nice. Strange but true. If your kids are early risers like mine were, lay out your clothes the night before, find a no fuss hairstyle or up-do, and if you don't have time to shower or the kidlets won't give you the luxury of privacy, cultivate the lost art of 'a wash'. My parents and grandparents were raised in an era when baths and showers were not a daily occurrence. Instead, they made do with a bowl or basin of warm water, a washcloth, soap and talcum powder. Most often it was Sunlight soap, and either Johnsons Baby Powder or Cussons Imperial Leather. Mum and Nanna would add a splash of 4711 Cologne, or Avon 'Roses, Roses' scent. Grandpa was in favour of Old Spice. Those scents figure largely in my childhood memories and I cannot to this day, smell 4711, Old Spice, Imperial Leather, Johnsons talcum powders or a Rose perfume, without it conjuring vivid pictures of my Mum and Grandparents . Let these delicate scents be memories for your children too. Not only that, you'll look and feel fresher, and more equipped to start the day. I don't have anything nice to wear anyway (often followed by 'all my money goes on the kids') - I meet so many Mums whose childrens closets are bulging with clothes and whose bedrooms are cluttered with toys that they barely look at. Meanwhile Mum is schlepping around in beaten up track pants, sneakers and a t-shirt with a Death Metal slogan. Stop. Just stop. Think about the example you are setting for your children. You can be a good parent, without completely losing touch with who you were pre-Motherhood. Sacrifices are part of parenthood. Martyrdom shouldn't be. Nobody is looking at me - I am. If I am, perhaps others are too. What you really mean is 'I don't want anyone to look at me'. Why? Is it because you've lost the plot, figuratively speaking, and your self esteem is shot? Well, the first step in correcting that, is to start making more of an effort. It's a which came first, the chicken or the egg, argument really, isn't it? I'm too fat - I'm fat too. I have friends who are fatter than they'd like to be. I make an effort. They do too. I've found the best strategy is to work out your body shape and proportions, and start finding things that suit you. It might mean thrifting, lay-bying (layaway), saving up, or sewing and altering. But it can be done, and it can be done inexpensively. I've completely revamped my wardrobe in the last three months and I've spent under $250. Some was thrifted, some purchased inexpensively in chain stores, some altered from what I already had. You can do it too. I'm too skinny - Believe it or not, that was my complaint 40 years ago. I was soooooo thin, my arms and legs were like sticks. Oh to have that shape now...lol! But I was so self conscious, and couldn't wear the plunging necklines and halter necks I loved because I had no cleavage and arms like pins. I should have just tastefully flaunted what I had. Look at Kate Moss! You too, can use the Body Shape and Proportions links in this post here, and find what suits YOU. 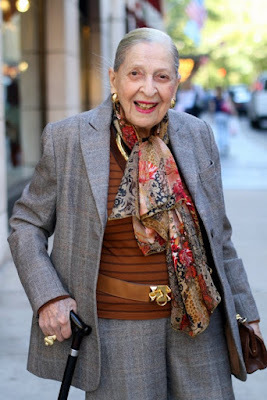 I'm too old - the lady in these photos is 100. You still wanna float that one?? Nothing looks good on me anyway - Use these calculators to learn more about your body shape and proportions. Find out here, whether your skin tones are Warm or Cool. Research on Pinterest and Polyvore. We can ALL look good. It's a learning curve. I'm still learning! Give yourself permission to invest time, effort, energy and a little money in self. It's the best gift you can give your loved ones, I promise. My husband likes me like this - Really? Are you sure? I've heard this a dozen times or more. Sure he says that. My husband has said it too. But in the last little while, since I've started this New You journey, his compliments, usually reserved for when we're dressed for an event, have been coming thick and fast on a daily basis. Maybe it's positive reinforcement. Maybe, just maybe, he loves you no matter what, but he'd love you to value yourself too. I can't afford nice clothes - Can you afford other things in life? Could you minimise your spending in those areas to carve out a small clothing budget? Could you cut back on a few other things that you consider luxuries? Daily latte's, chocolate bars, that bottle of wine once a week, cigarettes, manicures. They're all lovely, but ultimately not the best way to 'invest in self'. I've spent as little as $15 at my local upmarket thrift store, and walked away with an entire new outfit. $15 at a decent thrift store, also buys a quality leather bag, two pairs of trendy looking sunglasses, some costume jewellery like strands of faux pearls and stud earrings, a skirt or pair of jeans and a shirt. That's three Latte's, a single bottle of wine, a packet of ciggies, and half a manicure. Sorry. Try harder. This is comfier - I know. I like comfy too. But I have lots of 'comfy' clothes that I'd still be proud to answer the door to the Queen in. Comfy doesn't have to mean frumpy, ugly, ill fitting, dirty (unforgiveable), smelly, baggy, or stained. Yet sometimes 'comfy' seems to mean all of those things. Listen when I say...it's not good for you. It just isn't. I'm just at home all day - Riiiiight. Annnnd? So every time you walk past a mirror, you avoid it? Or do you just avoid mirrors altogether now? Look nice for YOU. Please. My friends/husband/family would think I was getting too big for my boots - They'll get used to it. That is all. It's too hot - Tough one. I live in a climate where it's around 25-38C for nine months of the year. I feel your pain. You just have to get clever with what you buy. It doesn't have to be about badly fitting denim shorts and stretch camisoles. 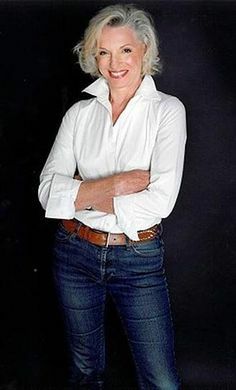 I have many lovely dresses, pants and shirts in cotton, cotton voile, jersey knit, linen blends and rayons, that are cool and comfortable to wear, and don't leave me looking like I'm on my way to a fishing trip. It's too cold - Yes. The temptation to stay in ones pyjamas can be overwhelming and when the closest thing to that is a tracksuit, then it's easy to see the allure. Unfortunately, Track Suits are alluring for no-one but the wearer. Choose well fitting jeans in a dark colour, silk or merino thermal underwear if you live somewhere really cold, warm socks and boots. You'll look better, feel better, and you'll still be warm. Who cares? - I do. Those who love you do. You should too. I have little kids and I'd just get dirty - This is why Mum and Nanna had aprons. 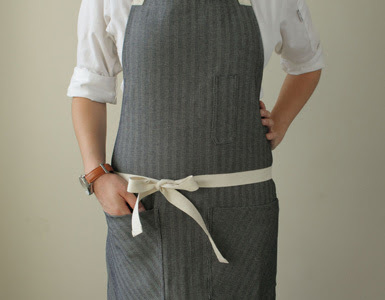 Aprons can be found in many forms and they don't have to be floral and frilly unless you like them that way. Aprons withstand all kinds of abuse, and you can whip them on and off at a moments notice. They're relatively inexpensive, and you can make them yourself very easily. Look at these ladies. These look like most of the ladies I see in my neighbourhood. And I live in what is considered a 'nice' neighbourhood. They look neat, clean and tidy, I'll give them that much. But there's not a lot of EFFORT going on. Sorry. Below is a second group of suburban ladies. Nobody is looking ridiculously overdressed. They've just made more of an EFFORT. I do see ladies like this in my neighbourhood too. More of that I say. So you need to start somewhere. If you don't know where to start, you could do worse than dark jeans and a white shirt. Remember that apron too! Having a bad hair day? Cultivate a way with headbands, a messy bun, or a turban, beret, stylish beanie or other headwear, like this lady. 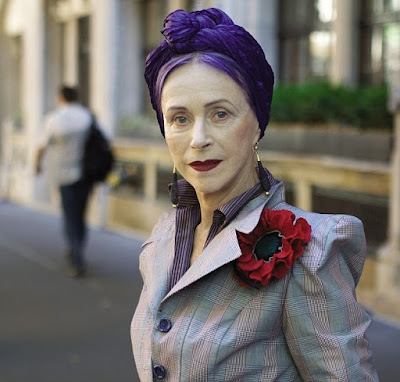 I've seen a couple of very mature ladies in my local shopping centre who favour the turban. It covers all ills from bad hair, accident with hair dye, and can't-be-bothered days. Remember, this lady below, is 100 years old. I've included several photographs of her. If she can look like she's made an effort, so can the rest of us. Please. Do it for yourself. I hear what you're saying. I have always changed when I leave the house to go to the shops or head away from home. However at home I was not dressed very nicely at all. In fact the clothes that I had been wearing, prior to your starting this series, were not even good enough to be donated. Some have become rags and some went straight in the bin. I needed replacement clothing. I went into a store that was having a sale and picked up four dresses for $60. I have since added sandals, also picked up on sale, shorts and dresses from op shops and a new handbag, also bought on sale. We have an elderly neighbour who is always immaculately presented. She is a beautiful lady inside and out. 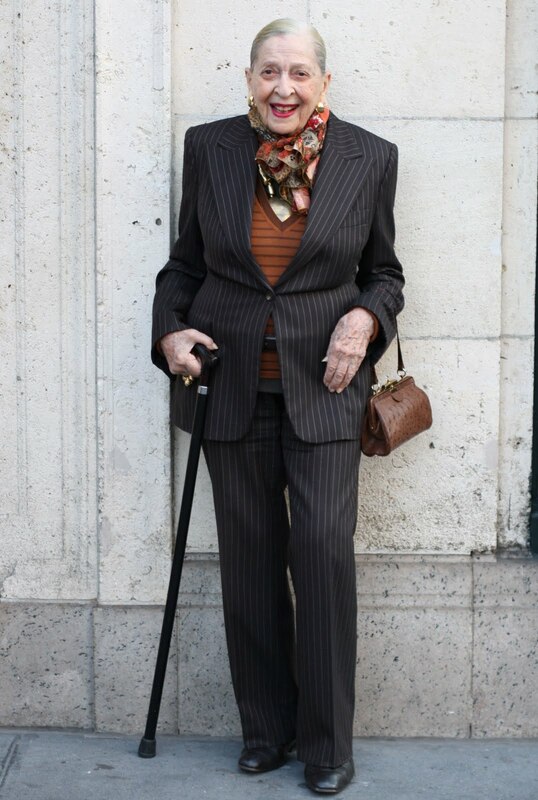 This neighbour is in her early 80's and would give your 100 year old a run for her money in the well dressed stakes. I was in the first group of ladies pictured in your post. I now think I am a beachy version of the second group. I am a beachcomber, and I am now a well dressed version of one. I wasn't quite in the first group, but am making more of an effort to be in the second. The ladies in the first photo don't even have good posture, something else I am working on. I agree with it all. I will add the absolute zero effort I have seen even at weddings and funerals. This seems really rude to me. Also workout wear that is virtually underwear in the shops etc. eek. Annabel have you looked at Ezybuy? Sometimes you need to pay to get what you want. Great blog! Made me take stock of myself. I fall in the first group of ladies since I retired. Will definitely be working on myself image. I have always loved seeing older women from the era of the 40's that know how to present themselves, very classy. Love this post and while I am still working on me (chiropractor is actually changing my shape) I have never dressed like #1. #2 was too glitzy for me where I have lived in my life so I am a betweener. Jeans have never been part of my wardrobe, they have always made my knees ache. Might have to see if I can find a pair for winter. My project yesterday was to start going through my summer wardrobe. I have a large box with things in that I either haven't worn this summer or have seen better days but are still wearable so they can go to the op shop. Did find a fair few new pairs of 100% cotton 3/4 pants so they will be washed ready to be worn and the ones I have been wearing are now my 'around home' pants. Because we live right on the beach and the shopping centers I go to either have people dressed worse than #1 in attendance or a holiday area I think these will work well. Just need shoes and I am set. The one big thing I am doing for myself this year is getting my ears re pierced once the humidity has left. I adore wearing earrings and have some really nice ones but my holes closed over years ago after a few days of not being able to wear earrings. I have also updated my nightwear - new winter dressing gown, both summer and winter nightgowns, just the slippers to come. Excellent post. What an inspiring woman. Your encouragement is appreciated Mimi and I am slowly getting there. Wearing clothes for the day and deciding at the end of it whether to put in the wash basket or in the bin. The bin is winning! This includes ill-fitting bras and underwear long past their use-by date. Still trying to work out the best clothing choices for a short waisted rectangle turning apple! I strongly resemble Lady #5 in the first pic, but her sweatpants are way fancier than mine!! Honestly though, I have to say that since you started cheering us on to take some pride in our appearance, I have made several good changes. My jeans are still too snug- I try them on every week!- so on cold days, I'm still in my sweatpants. But wait! Even so, I've been doing my make-up, my hair, I match, no rips or stains, etc. And I do feel much better. I've also gotten better at home. I wear old ratty clothes to clean in the morning, but by 10 or 11 am, I've changed into something I wouldn't be ashamed to answer the door in. I have some long denim skirts that I think are a little too worn to wear out, but with a nice flannel shirt, they look rustic! And I'm warm. Thanks for inspiring me, Mimi! My thankyou too ,for cheering us all to look nice and make that extra effort . When I read this post last year I did the measurements and knew I was a ruler/rectangle shape but was never sure why I felt my legs needed to be longer Yo look right , in some outfits . Duh! It was staring me in the face after I did head to thigh ( I think it’s to there but not sure now)then thigh to feet ie top half versus bottom . And legs are slightly shorter . That has been helpful with top snd dress lengths and footwear . I’m still trying to this balance right and getting there . Thsnkyou mimi for all your encouraging posts .